An 11km lake formed by a landslide in Pakistan’s Northern Areas in early January is threatening to breach its banks and wash away villages downstream, endangering 45,000 people. The landslide, in the Hunza valley on January 4, destroyed a village killing 20 people. 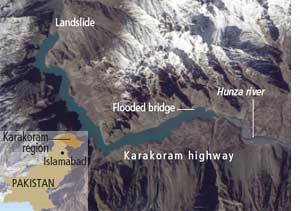 It blocked Hunza River, creating the new lake. Geologists have warned water level in the lake is rising at about 35 cm a day, increasing pressure on the lake wall. A burst would release up to 20m high flood waves, which could travel up to 50km and hit Tarbela Dam—the country’s largest dam on Indus River—wiping out villages on the way. With the onset of summer and snow melt in the mountains, army engineers are racing against time to build a spillway to drain water from the lake. People in high-risk areas have been asked to move to safe zones. For those further downstream, who have half an hour to escape the flood, an early warning siren has been installed. The lake has also submerged a stretch of the Karakoram Highway, the road link between Pakistan and China.